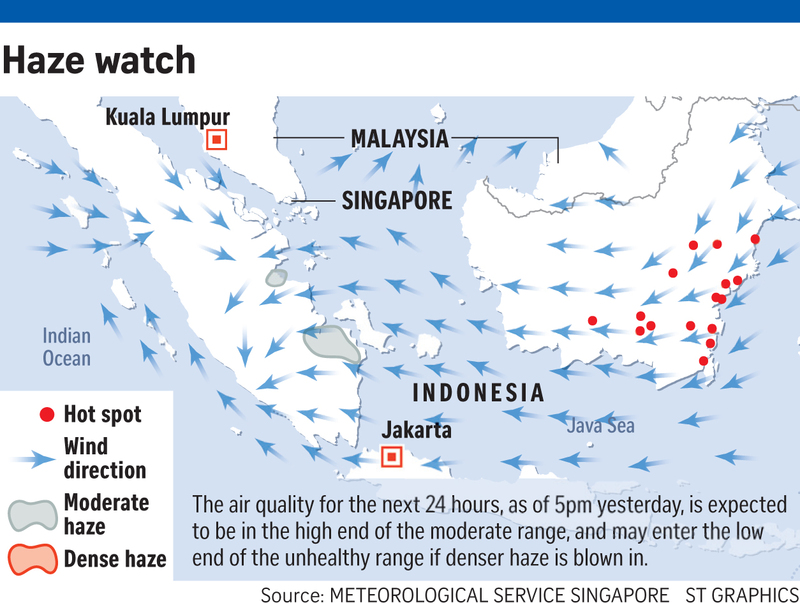 The haze is creeping its way back into Singapore, after a brief hiatus brought on by increased rainfall. Air quality here for today is expected to deteriorate into the high end of the moderate range, the National Environment Agency (NEA) said in a forecast yesterday. And it may even waft into the low end of the unhealthy range if denser haze is blown in. This comes after a week of clearer skies thanks to wetter weather, with 24-hour Pollutant Standards Index (PSI) readings staying well in the middle of the moderate range of 50 to 100. Despite continued showers and a fall in the number of hot spots in Sumatra from 66 last week to 55 yesterday, the haze is still expected to make a return here. As of 5pm yesterday, the 24-hour PSI reading was 75 to 86. The one-hour PM2.5 reading then was 40-50 micrograms per cubic m.
Prevailing winds today are expected to be weak and blow from the south or south-west, with thundery showers forecast in the late morning and early afternoon, the NEA said. Slight haze and reduced visibility conditions can be expected "if winds are unfavourable", it added. Given the air quality forecast for today, the NEA advised healthy people to reduce prolonged or strenuous outdoor physical exertion. Dr Erik Velasco, a research scientist from the Singapore-MIT Alliance for Research and Technology, said that rain in Singapore is no permanent cure for the haze here. "If we experience heavy rain, it will be a temporary relief, but only for a few hours," he said. "What we need to stop the haze is more rain in Sumatra and Kalimantan." Dr Velasco added that if winds continue to blow from the south and east, where Sumatra and Kalimantan are, respectively, hazy conditions will also persist. He also cautioned that a drop in detected hot spots may not necessarily mean cleaner air. "Satellite images may not be able to pick up all the hot spots if conditions are cloudy," he said. Still, he remains optimistic about the air situation here. "I'm not expecting very serious haze here again," he said. "It has been raining in Kalimantan and Sumatra, and the number of forest fires has dropped a lot."